This is our last day the jungle, and we are up @ 4 am. Evidently the wildlife is up early, and if we want to see it, we must be also. Some "vacation" this has been! Breakfast is by candlelight at 4:30 am ~ that's a new one for me ~ and believe it or not, it's already (you've heard it before) bloody hot. So hot and humid. So I'm hot, and I'm sticky and I'm tired. as we've yet to see first light. We load into the long boat, to go upriver to our landing site. And, as the song says, "Here comes the sun". Glorious! The indigenous family that lives here act as a sort of "gatekeeper" to the lake that we'll be visiting today. I feel like I might have stepped into the middle of a National Geographic special. This papaya was some creatures' breakfast. And this vine appears to be masquerading as a painter's brush strokes. It's just a short hike, and we arrive at our catamaran. 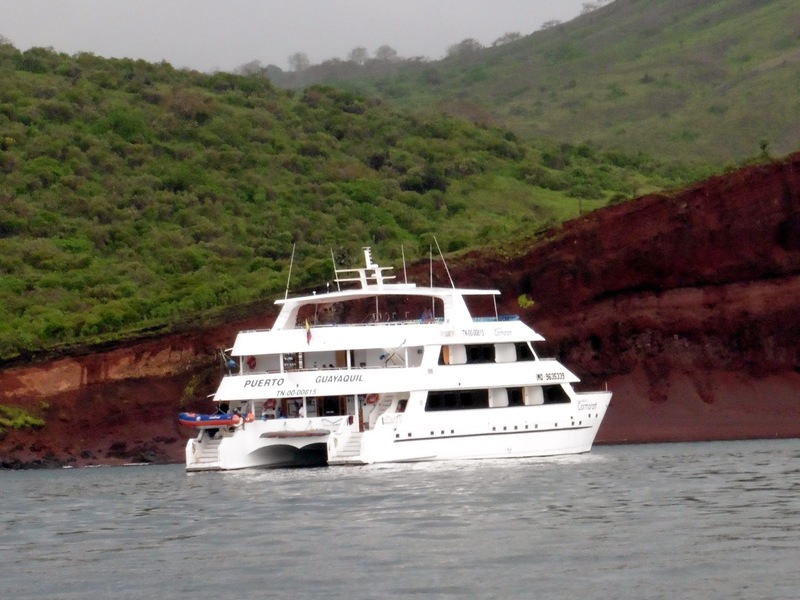 Or this one in the Galapagos. So the jungle catamaran was a bit of a surprise. I didn't expect luxury, mind you. But I wasn't expecting this, either. This is our catamaran. The guys give us a push-off, and we are launched. Right out of the gate we are blessed with a visitation by the river otters. As long as I can remember, I've always been delighted by these happy little creatures. I love how playful they are, rolling and swimming and splashing about; and I particularly like their dining style, when they flip over on their back, park their picnic right on their belly, and proceed to consume it with joyful gusto. Next up we spot this weird river snake. I wish I could remember the name -- it's face looks like a duck bill, and it stands up out of the water as it's swimming. Yikes! And another snake, this one hidden along the grassy shore. These tree bats were interesting to watch. All tucked in a neat little row, end-to-end. When one got restless ? or irritated ? or ready for a change of scenery ?, he would scurry on down to the very end of the line, and everybody else would shift up a notch, till they closed the gap and were end-to-end once more. There are birds and insects and the like. I was particularly fascinated by this ? moth I think. So delicate. But by far the highlight of the day was fishin' for piranhas. I've never seen one, and I may (I'm most likely gonna') never pass this way again.......so I'm all in. We "park" in the reeds so we are anchored for the moment. Using just muscle and a long stick. So we dip the bait into the water, and try to pull it up quickly when we feel them nibble. They are excellent fishermen, stealing the bait away without getting caught nine times out of ten. and we all get an up-close-and-personal encounter. Someone asks the guide if those little teeth are really that sharp ~ and would they bite us if we gave them a finger to chew on. So he demonstrates with a leaf. Yup. Just like a buzz saw. Best keep our fingers to ourselves. I've read that they serve the bigger ones for dinner here in the jungle. But we return this little guy to the river before heading back, feeling satisfied with the checkmark of a new encounter with one of God's special creatures. I may never pass this way again, you know. It's truly beautiful and peaceful; and I'm glad that I dragged my little fanny out of bed so early this morning. The thermometer is climbing by the minute, and I appreciate that our guides did their best to help us miss the mid-day heat. Now it's back through the forest to our longboat, where we spot these Puma tracks; there's lots of things roaming the night, apparently. Then back downriver to the dock at our camp; then back through the jungle to the lodge (was it 67 steps or 167 steps? ); and it's time for Jungle Lunch. I'm famished! The bananas have to be kept in this cage so the jungle critters don't cart them all away and leave none for us humans. We found this bright little guy (not-so-little, actually) in our room. I'm becoming more appreciative of the mosquito netting by the minute! Could have been worse ~ could have been this enormous rhinoceros beetle. He's nearly as big as my hand! But I can't linger too long, I want to be first in line @ the dining hall. Breakfast feels like a long time ago. They really do a nice job with the meals here. My visit to the kitchen is still on my "must do before I leave the jungle (forever)" list. They eat potatoes at nearly every meal here in Peru. But they are serving us lovely vegetable platters, also, which is not-so-Peruvian. I especially appreciate it, though, knowing that their supplies are all shipped in. By longboat. This is a delicious meal, no matter what country you find yourself in. Especially after a busy day of catchin' Piranhas. I chose to pour my chicken and sauce over rice instead of potatoes. I'll post the recipe for you, watch for it. But wait, the day is only half over. We have an afternoon excursion (or two), as well as a night jungle hike still to go.......And have I mentioned the heat, and the killer humidity? Wow. I'm really incredibly tired! And so very hot. Wow! My choice to see in the water would NOT be those creepy snakes! I'll bet you dreamed of air conditioning! So glad you got this checked off your list!